You didn't win! 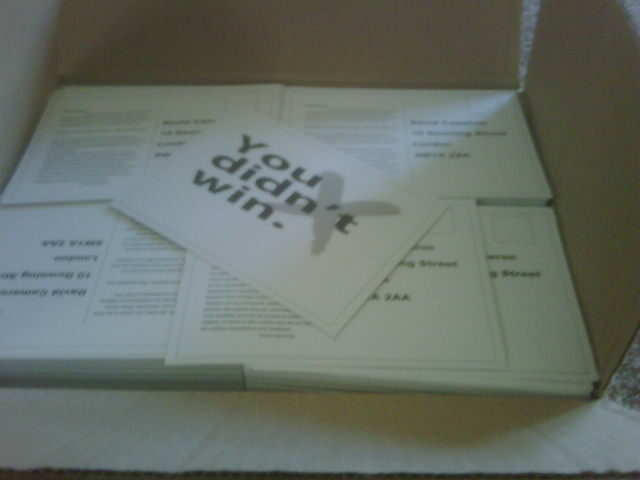 : The Postcards are Here! Exciting times here at You Didn't Win headquarters. This afternoon, while I was tucking into some wholewheat fusili and watching the start of Michael Moore's Capitalism: a Love Story, I heard a loud knocking at my door. I opened it and, after signing one of those electronic things that makes my writing look even more like that of a four-year-old than usual, I was presented with a large box. And do you know what was in that box? The official You Didn't Win postcards, that's what! Now that we have postcards, we need to start distributing them. And that's where you come in. If you want some cards to distribute in your area, email us at youdidntwin@hotmail.co.uk or message us on our Twitter feed or Facebook page telling us how many you need and we'll send 'em to you! There's no fixed price, but the observant among you will have noted the appearance of a Paypal button at the side of this blog - we'd love it if people would donate whatever you feel you can to support the campaign - this will cover the cost of this run of postcards (and maybe another if we have time before the end of the week) as well as postage for sending the cards out and any other operating expenses we incur. Any surplus left over will be donated to a charity of our choosing. Remember, we don't want cards sent to Dave yet - send them on May 5th to arrive for the election anniversary. But if you want official cards to send - get in touch with us now and we'll get them sent out as soon as we can, so that this Friday we can all remind Cameron and his Tory-led government that they didn't win!